The emacs development team is hard at work on emacs 24. As far as I know, there is no planned date for it yet. I'll write more about all the new cool things when we're a bit closer to the release date, but I'd like to highlight emacs 24 color-theming already, as it's an area people outside the core development theme should be able to contribute to as well. Here at Emacs-fu, we already discussed color-theming and in particular the zenburn color theme; this was all based on the color-theme-package. While being popular, there were a few problems with that package, which is why emacs-24 comes with a new scheme for doing this. The current development versions of emacs ship with a few themes (tango, tango-dark and wheatgrass), which you can activate with M-x load-theme. It would be great to include some more color themes, and to encourage this, emacs maintainer Chong Yidong has written the GNU Emacs Theme Generator (currently in bèta), which helps you in the process of making a simple theme. This tool currently only support changing colors, and not e.g. the boldness or slant, but it's a nice way to get started, and to immediately see the results. For more complex theming, there is M-x customize-create-theme; however, that is built on the (in my opinion) cumbersome customize-interface, so I'll probably start by creating a basic theme with the web tool, and then edit it by hand. If you design some attractive color theme and would like to propose it for inclusion in emacs 24, you can send it to emacs-devel. Web browsing is one of the few computer-based activities for which I usually do not use emacs. Of course, there are of emacs-based browsers like w3m, which is pretty good. But for the 21st-century web, a text-mode browser is a bit limited. There are some efforts underway to integrate a graphical web browser experience in emacs (e.g., using Xembed), but it will take a while before that is ready. The next best thing to web browsing with emacs, is a browser that is inspired by emacs. Such a browser exists: it's called conkeror (not to be confused with KDE's Konqueror). 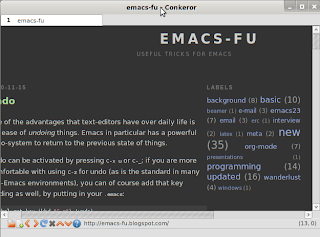 conkeror is a Mozilla-based browser that brings an emacs-like experience to web browsing. I've been using it for more than a year now as my primary browser, and I am quite happy with it. Conkeror is a user-interface for the normal Mozilla/Firefox engine (xulrunner); this means that all those websites that work with Firefox, work just as well in conkeror, including things like ad-blockers, Java, Flash etc. and many plug-ins. This is a very important point for me. 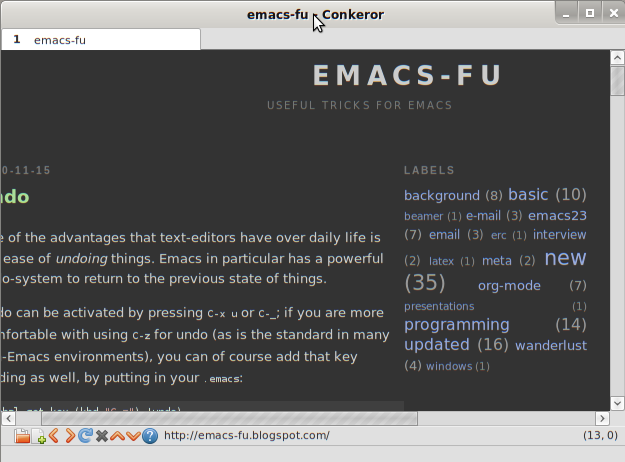 If you like emacs, you'll probably also like conkeror. For starters, it uses many of the same key bindings – C-x C-f will open a url in a new buffer (tab), C-x 5 2 will open a new window (frame), I can inspect a key-binding with C-h k… and so on. Some of the single-key shortcuts are the same as those in w3m, like g to go to a webpage, or B to go back. Conkeror is fully keyboard-driven; it allows you do almost anything on the web without using the mouse – it can overlay numbers on items in a webpage so you can interact with them by their number. Of course, you can still use a mouse if you want, too. The conkeror wiki gives many more examples. It also discusses installation in quite some detail, which makes life a bit easier for me :) Instead, I will just list a couple of the customizations I have made and encourage you to try for yourself. Plain-old bookmarks are easy to add with define_webjump – and you can just bind them to a short string. You can then 'jump' to the corresponding website by pressing g and then this short string. For example, to go to Emacs-Fu, you could type g efu RET. No mousing around needed. Smartlinks are just like normal bookmarks, which the one difference that they contain an %s-parameter which will be replaced by whatever you type after the name of the bookmark. Thus, g imdb grande bouffe RET would take you to the IMDB-page about the movie La Grande Bouffe. Another useful feature in conkeror is the ability to interact with Emacs (or any other text editor), so you can use emacs for writing text in web pages; for example, when you're using emacs-daemon (you should), you could can add the below, and C-i will then take you to emacs whenever you are in a text field in a web page. It's not necessarily so easy to find the exact functions / objects you need to accomplish what you want. There's a certain learning curve – just like when using emacs. Now, when in conkeror, you can select some text, push C-c c ('capture'); emacs will offer you to save this text, including a link to the source, the date and so on, and saves it for later retrieval. I really love this feature! These were just a couple of the many things you can do with conkeror; there's so much potential here. I haven't discussed many of the other powerful features, such as the page-specific modes, that give special features to specific websites, be it GMail or Wikipedia. I've been using this fine browser for a year or so now, and I really like it. There are a few rough edges here and there, but it's quite amazing what the small development team has accomplished. I heartily recommend it – for web-browsing the emacs-way, there's simple no better alternative. Finally, if you're using conkeror already, and have some clever tricks you'd like to share, feel free to do so in the comments.